ITV completed its Wales bureau move this week, launching from Cardiff Bay. Cardiff Bay may be familiar to British TV fans, as the home of “Torchwood” and many “Doctor Who” episodes. After weeks of testing and rehearsals, all ITV programming is being transmitted through the new HQ at 3 Assembly Square. 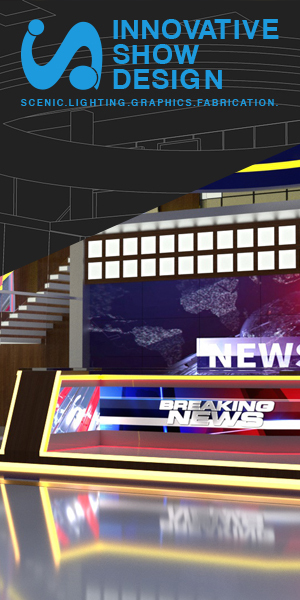 The news studio has a familiar look, matching the ITV set design launched in January 2013 by BDA Creative. Read our exclusive interview with BDA’s Simon Jago about the overall ITV News redesign. 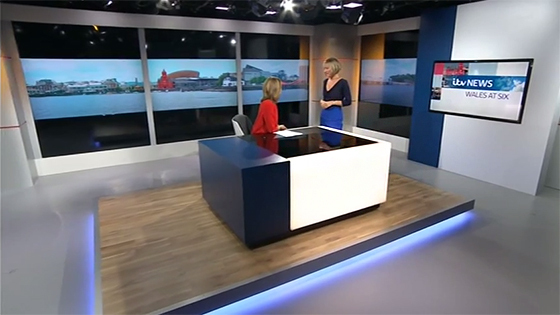 Unlike its network sister set, ITV Wales has a completely real set, with no virtual technology used. We question the large black bars above and below the video screens on the set. They create an odd dead space that could have been better used in the design. Overall, though, the set is nice for the operation size. It also has the plus of being real.